DEPICTIONS OF THE SUBURBS in movies and on TV run the gamut from A to, well, maybe C. Life there is derangingly conformist (``American Beauty"), creepily repressed (``Blue Velvet"), farcical (``Desperate Housewives"), or some combination of the three. What the suburbs never seem like is a setting for history. Dismissed as places without a sense of place, they also seem timeless, in a bad sense: Except for the square footage, what separates the Levittown of the 1950s from a new cookie-cutter subdivision? But though the subject doesn't have the sexiness of the Civil War or Jacksonian democracy, a growing number of historians are taking a close look at the `burbs. ``In any history of postwar America, the suburbs deserve center stage," write Kevin M. Kruse, an associate professor of history at Princeton, and Thomas Sugrue, a historian at the University of Pennsylvania, in their introduction to ``The New Suburban History" (Chicago), a new collection of essays that serves as a manifesto on the importance of the subject. ``We aren't claiming to have invented the wheel," Kruse cautions. Numerous scholars of urban planning have charted the growth both of carefully planned subdivisions and unchecked suburban sprawl. Kenneth Jackson, a Columbia University historian, produced a much-lauded history of the suburbs, ``The Crabgrass Frontier: The Suburbanization of the United States," in 1985. But that ``old" suburban history, the authors say, often featured a certain consensus narrative, in which the suburbs were lily-white, homogeneous, and bland-in contrast to the gritty, authentic city. That's not entirely wrong, but some recent titles of academic books capture the shift in perspective among a new group of scholars: ``My Blue Heaven: Life and Politics in a Working-Class Suburb of Los Angeles, 1920-1965" (2002), for instance, by Becky Nicolaides, and ``Places of Their Own: African American Suburbanization in the Twentieth Century" (2005), by Andrew Wiese. (Both Nicolaides, a historian at the University of California at San Diego, and Wiese, of San Diego State University, have essays in ``The New Suburban History.") The suburbs, in this new perspective, have as much to do with 20th-century social and political movements as do Birmingham or South Boston. In ``Places of Their Own," Wiese wrote provocatively that ``historians have done a better job of excluding African Americans from the suburbs than even white suburbanites." As early as 1940, one in five black Americans lived in the suburbs, suburbs that were a world apart from Mayfield, the home of the Cleavers. According to a contemporary sketch Wiese quotes, the suburbs of Los Angeles just after World War II featured: ``canary farms, artificial pools for trout fishing, rabbit fryers, dogs at stud, grass-shack eating huts, psychic mediums . . . bicycles to rent, and frogs for sale." In other words, not exactly picket fences and manicured lawns. 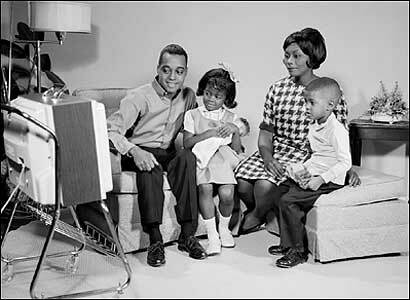 As prosperity increased in the postwar years, Wiese explains in his essay for ``The New Suburban History," the African-American magazine Ebony was full of illustrated articles celebrating the ``sumptuous" suburban homes of celebrities and entertainers. Yet poorer African-Americans were also lured outside the city, and by the same thing that attracted nonaffluent whites: the promise of a bit more space and maybe even a garden. Today, one third of blacks live in the suburbs, as do one-half of Asians, and one-half of immigrants. Nevertheless, the lily-whiteness of most middle-to-upper-income suburbs remains a crucial part of the story. In an interview, Matthew D. Lassiter, an associate professor of history at the University of Michigan, calls the federal housing programs of the `40s, `50s, and `60s ``the most successful segregation system in American history." Federal mortgage guarantees, a massive intervention into the free market, made buying single-family homes possible for millions of Americans. But official (at first) and unofficial (later) guidelines forbade lending to blacks who wanted to move to ``white" areas, on the grounds that integration led to deteriorating property values. The lenders' contention that such decisions were based purely on economic calculations, not racism, was grabbed like a baton by white homeowners in the late `60s and `70s, as they resisted integration. And politicians on up to the White House aided these white suburbanites in their cause. President Nixon, for example, told Attorney General John Mitchell that he had only two litmus tests for his Supreme Court appointments, Kruse writes in his recent book, ``White Flight: Atlanta and the Making of Modern Conservatism" (2006). ``He must be against forced busing, and against forced housing integration." Both Kruse and Lassiter have argued that Nixon's so-called Southern Strategy, with its coded racial appeals to whites, might better be called a nationwide suburban strategy. ``Through his policies and appointments," Kruse writes, the president ``ensured that suburbs across the country would remain isolated from urban problems and undisturbed by federal action." The new suburban history has so far spawned more books than courses. But since 2002, Lassiter has been lecturing on suburban history to 150 students each year at the University of Michigan. Many of his students are upper-middle-class suburbanites. Virtually none know that Martin Luther King Jr. gave a version of his ``I Have a Dream" speech in Detroit, two months before his March on Washington-nor that one of his goals there was to help desegregate white suburbs like Grosse Pointe, Dearborn, and Oak Park. Marches in those towns followed. ``My students had no idea that the areas they grew up in were affected by the civil rights movement," Lassiter says. They had no idea that-at least in an academic sense-the suburbs are interesting. Christopher Shea's column appears biweekly in Ideas. E-mail critical.faculties@verizon.net.